CAMBRIDGE, England (CNS) — Pope Francis is inviting Catholics to take a more holistic approach to their faith, and that requires a change in underlying assumptions, said Chicago Cardinal Blase J. Cupich. The pope is not offering the new approach in a vacuum, but is basing it on church teaching, including documents of the Second Vatican Council, Cardinal Cupich said in a lecture at Cambridge University Feb. 9. Pope Francis’ apostolic exhortation on the family, “Amoris Laetitia,” makes the case that couples and families face challenges today that are different from the past, Cardinal Cupich said in the Von Hugel Lecture, a speech sponsored annually at the Von Hugel Institute for Critical Catholic Inquiry. The institute is part of St. Edmund’s College at the University of Cambridge. “‘Amoris’ is nothing short of the Holy Father’s call to action, in which he summons church leaders, both lay and clergy, to enter into a serious dialogue about how best to minister to couples and families in a way that is faithful, honest and creative,” the cardinal said. Some of Pope Francis’ teachings in “Amoris Laetitia” have come under criticism by Catholics who think he is abandoning traditional church teaching on marriage. 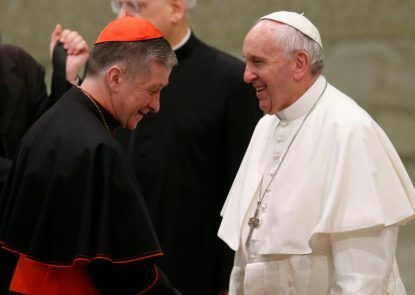 But Cardinal Cupich said that, in calling for a change in approach, Pope Francis relied on consultations with the faithful and deliberations of the 2014 and 2015 Synods of Bishops on the family. He said an examination of the exhortation called for a shift in thinking in six areas. “If we accept that families are the privileged place of God’s self-revelation and activity, then no family should be considered deprived of God’s grace,” Cardinal Cupich said. This means God is not just found in families that meet the church’s idea of an ideal marriage, but in marriages of other religious traditions and in couples who have remarried. The church’s ministers must shift how they interact with families and married couples, maintaining a balance between teaching and listening, the cardinal said. “The most important consequence of this call to accompaniment ought to be greater attention to the voices of the laity, especially on matters of marriage and family life, for they live this reality day to day,” Cardinal Cupich said. Another shift is to incorporate insights of the faithful in the church’s understanding of marriage, Cardinal Cupich said. “There can be no better teacher for the church than the faithful who actively walk this path of personal development,” he said. Pope Francis is calling for a shift from a straight doctrinal approach to marriage to an approach that combines doctrinal and pastoral attitudes, Cardinal Cupich said. One of the best ways to do this to the create a culture of care and hospitality in parishes communities, especially for those in second marriages, Cardinal Cupich said. While people who are divorced and civilly remarried generally are not allowed to receive the sacraments, they are still considered Catholics and are encouraged to attend Mass. The final shift in thinking Cardinal Cupich identified involves putting mercy back at the heart of the Gospel. “Doctrinal development is about remaining open to the invitation to see our moral teachings on marriage and the family through the lens of God’s omnipotent mercy,” the cardinal said. In calling for these changes, Pope Francis is “retrieving a way of thinking about church teaching and practice that has its root in our tradition,” Cardinal Cupich said.